Because our lives are have been centered around Westerosi cuisine for over a year, it seems only natural that we infuse a bit of that flavor onto our holidays. And now, with the autumn harvest coming in, leaves turning to fire on the hillsides, and Halloween approaching, how could we resist a few suggestions for your own festive gatherings? NB: The * indicates recipes that are in the cookbook. I’ve included them on the list so those of you with the book can consider making those dishes, too! The dishes in italics are forthcoming. I’m seriously excited about the sugar skulls, too. We throw a massive hallowseen party each year, and I’d love to make some of these treats for that! I keep checking back to see if you’ve figured out a sugar skulls recipe. Good luck! So many fantastic ideas! I love what you’ve put together here. 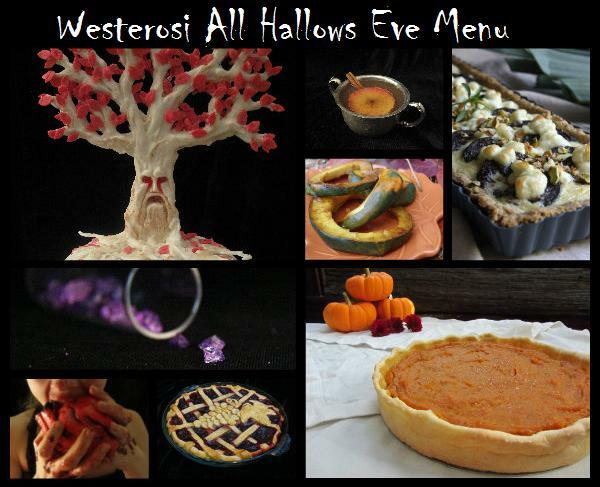 We’re not having a full-on Westerosi party (though I love the idea), but I think I’ll definitely try to incorporate some of these into our own more generic Halloween shindig this year. Thanks for the post! This year, I’m making an edible autopsy as my centerpiece. I’ll send pics on FB. Want to help out? Check out our Amazon Wishlist!